Yes, E is for Medic. Okay, fair enough, it’s also for Engineer and everything else beginning with E, but I’m not talking about what words start with. I’m talking about the default key that the Medic! call is bound to. Some people bind the Medic! call to other buttons, but most people I have spoken to leave it as E. It’s close, it’s handy, it’s easy to spam. It’s also the bane of all Medics. I’m sure, anyone playing as Medic knows full well what it’s like playing with a bunch of potatoes, all of which are spamming that damn call, while you can only heal one person at once. Or risk healing everyone at once with the Amputator. There’s also so many stories about people spamming the Medic! button when there isn’t even a Medic on your team. 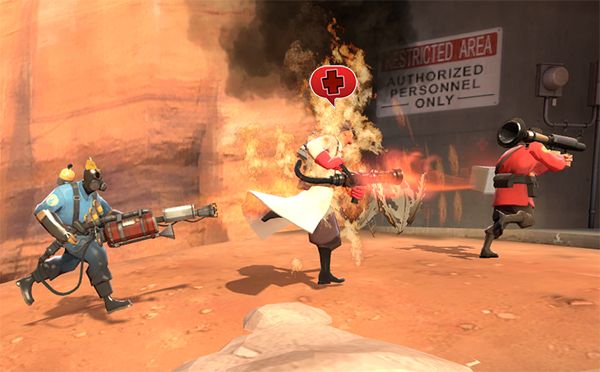 In fact, there’s an achievement for switching to Medic when someone presses the Medic! button. Funnily enough, it was one of my early achievements, unlocked on Teufort. But let’s look closer at the Medic! call. There’s much more to it than simply begging for someone to heal you. The symbol itself is a particle, with four different forms: normal, low health, normal and on fire, low health and on fire. These, obviously, help Medics pick who to heal first, although a Medic may forsake players depending on what class they are. Let’s face it, a Demoman is more important than a Spy. I won’t get into detail here on healing priorities though, because that alone could fill an entire article. What if I told you that Medic! calls weren’t just for begging Medics to heal you? Yes, you heard me, Medic! calls can be used for other means. In particular, Medic! calls can be used to help locate and find friendly players, useful when you’ve just respawned and are looking for someone to pocket on the way back to the front lines. Spies can use Medic! calls to trick Medics. There’s an achievement for that too, funnily enough. There’s a final use for the Medic! call, and it’s used by Medics themselves, generally not to be healed. Have you ever been playing quite happily, when your Medic starts shouting at you? Well, your Medic is trying to tell you something. A lot of Medics will spam the Medic! button to tell their patients that they’re being attacked. Some Medics spam the Help! and Spy! voice commands, but the Medic! call is generally more noticeable. As a final note, whether you’re a Medic or not, be kind to each other and don’t spam that button too much. Your team’s Medics will get to you eventually, and you can make things easier if you go to them. Don’t forget though,t here are other sources of healing, such as Dispensers and Medkits, but if you’ve got a Medic with you, leave the Medkits for them. Medics can’t quickly heal themselves, you know. What if your team hasn’t got a Medic? Well, maybe you ought to switch class then.